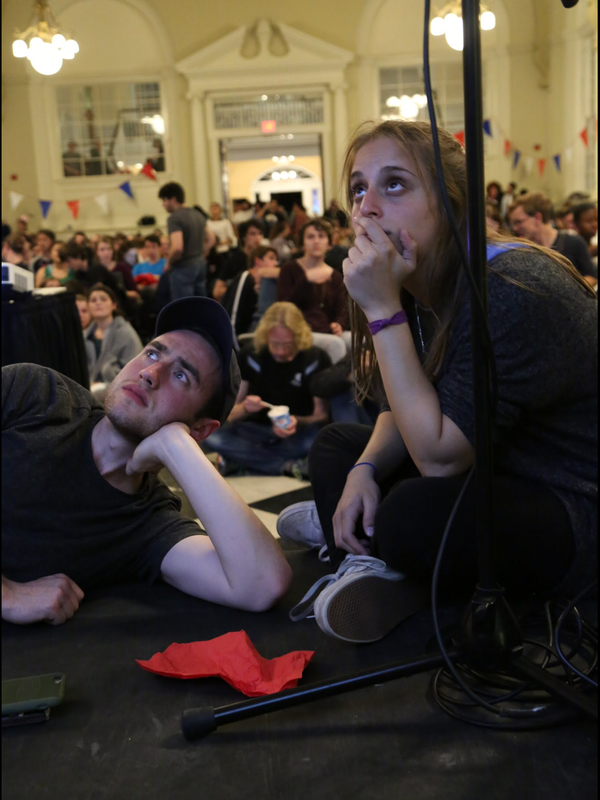 Ben Horwitz ’17 and Rachael Garnick ’17 of the Haverford College Democrats watch election results come in at the watch party in Founders. Photo by Cole Sansom ’19. When we first started writing this article last night, we thought it would be a very different story. The polls seemed to predict a convincing win for Hillary Clinton, and we were preparing to cover the historic election of the first female president. But as the map turned decisively red, the energy and optimism in Founders Hall – where hundreds of students had hunkered down for the night – evaporated. As the night went on, and it became increasingly clear that Donald Trump would be the next President of the United States, Founders Hall looked more like a funeral than a campus-wide election watch party – students broke down into tears, consoled each other, and gave hugs before leaving for the night. “I’m privileged to have had two countries I can call home,” said Cole Sansom ‘19, who also lives in Cambridge, UK. “I’ve already had one lost to xenophobia this year. I don’t want to lose the other,” he said, referring to the Brexit referendum this summer. But the despair students expressed on Tuesday evening has not yet dissipated. On Wednesday morning, students said that the rainy weather seemed like the poetic end to an emotional 24 hours – and election cycle. The campus was eerily quiet as many students sat out of class, primarily as a form of self care. And on the way to the Dining Center, students walked passed signs encouraging them to vote – a reminder that the election had come to a close. But many students said that “giving up” is not an option. “If there’s anyone that can make it through this, it’s the people that are affected directly by it because we’ve been through way worse,” said Sebastian Dilones ‘18. Some students made a point today to share words with the community in the hopes of helping to facilitate the healing process. Simon Poser ‘19 offered some thoughts about where the Haverford community – and the country – can go from here. Haverford opened a couple different spaces on campus today, including the Multicultural Center and CPGC cafe, to give students a chance to talk more about the election. There also was a “worship sharing” in Founders Great Hall at 7 p.m.